There are various books of Common Admission Test (CAT) and MBA Entrance Exams but useful and helpful books are very few. 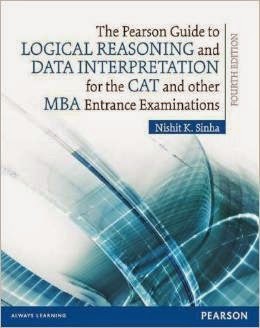 The book namely ‘The Pearson Guide to LOGICAL REASONING and DATA INTERPRETATION’ is also available in the market which is most helpful and useful for the CAT and MBA Entrance Exams than other books. The book is containing upto date material and huge collection of questions for practice. The book is classified into four parts i.e. Previous years papers which is more than sufficient to do practice and preparation for CAT for any student. It is helpful not only for CAT and MBA Entrance Exams, but also helpful for Business School Exams like MAT and CMAT etc. A student can never give his/her best performance without spending the time on practice so, practice questions are included in this book which provides the students a sufficient practice. The most influential section of the book is Data Interpretation. One time reading or practice gives the chance to students not only just CAT preparation but also for various other competitive exams like SSC etc. Foundation, Moderate and Advanced exercises are also included in the book which will become helpful for students. The classification of book i.e. 4 different sections also helps the students to understand the features of book. Detailed explanations are available at the end of every chapter which also helps the students when they will face the problems during practice or preparation of exam. The book is containing total 35 chapters. By learning every chapter one by one, students will reach at the top of success destination surely. The most important thing is to mention here that there are mentioned ‘Learning Objectives’ at the beginning of every chapter which will provides better understanding to students in the easiest manner. So, overall, from the overview of my whole experience, I feel that the book is so different and obviously better than other CAT preparation books available in the market.